I got two nice surprises this week. I did not have to be out of town this week, and my wife asked for 10-15 pens ASAP. She wanted them segmented , an all Zens. No time for the type of segmenting that I do, as they take me a bit longer - 2-3 days start-finish. So... I dug into my stash of blanks from Wood128. EDIT: Many newer members know Joe as a blank seller. But his segmented blanks are stunning - I included a link in the later post. It did give me the opportunity to play with his blanks as they can be tricky with the designs. 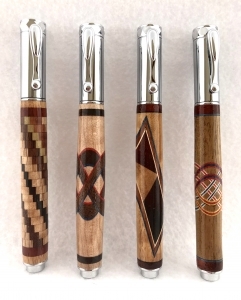 These are the first four pens, and in the next post I'll explain the design considerations. Last edited by mark james; 03-20-2019 at 04:56 PM. Those pens are very lovely, Mark !!!! OK, now for some additional info for anyone interested in these blanks. First, I'll mention that I consider Joe (Wood128) a friend, and greatly admire his designs. When I first started to play with segmenting, Joe was very encouraging to me with his instruction, suggestions and time. Second, if it appears that I am encouraging others to check out his blanks at Exotic Blanks - I plead guilty, with no remorse; they are worth the attention. OK, now many of Joe's blanks are beautiful, but as you begin to pair them with kits a few challenges become apparent. The designs on many blanks fit easily on a number of kits. Others not so easily. As a segmenter myself, I like end caps. And these simple modifications allow you to easily place many of Joe's designs in a visually appealing center position. 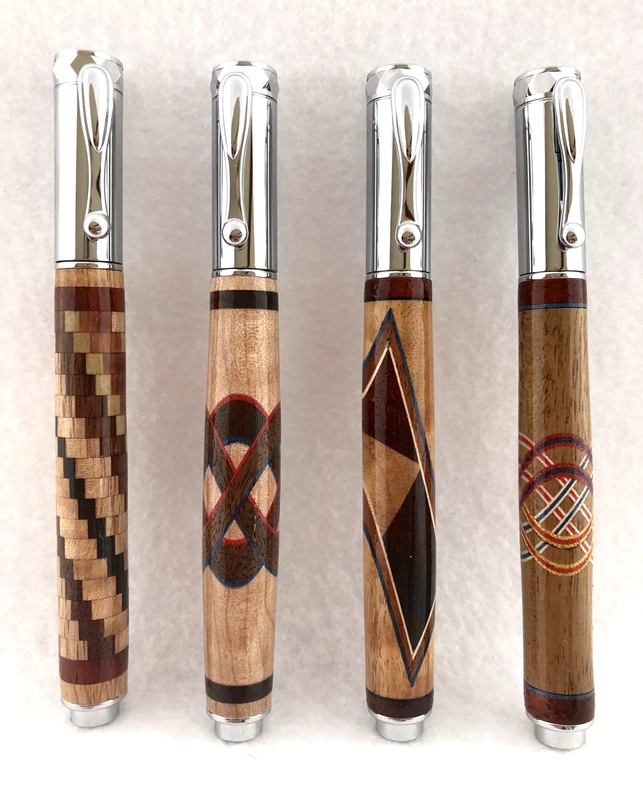 For these four pens, at times I used the end caps that Joe himself had on the blanks, others I made my own. The goal was to have the center of the design, in the center of the blank and have the end caps make up the space in equal dimensions. Here are some of the pictures, I suspect it is self explanatory, but ask any questions you may have. Last edited by mark james; 03-20-2019 at 04:49 PM. Oh, and the first pen - diagonal rectangle was made with Camphor wood. If you've never turned camphor - it is a real treat. The smell is even more pronounced than Olive Wood. Mark, thank you for detailing the "adjustments" you made ... very helpful !! The results are superb !! Hi Mal. I suspect you are familiar with these. For newbies: I did not highlight that many of his blanks need NO adjustments, some are excellent single barrel and double barrel. Just be mindful for tube placement if you are particular (as I am) about symetry. But for his blanks that are a tough fit... yes, modified end caps are the answer. Truly, I'm just throwing out suggestions/options for anyone who may want to play with segmented blanks either purchased, or home-made. You are well on your way. Good photos at the top. The pens as usual are awesome. Thanks for the write up. It is an incredible smell. If i have a cold, it's Joe's camphor blanks that get me into the shop for therapy!! Have to agree with you on the Camphor Mark and Earl. I got a piece of Camphor limb last year. It turns beautifully, finishes spectacularly and has a wonderful smell as it's being turned. Got sinus problems like I do, turn some Camphor for temporary relief. I made two pens and a bottle stopper from it. Last edited by wolf creek knives; 03-21-2019 at 09:31 AM.